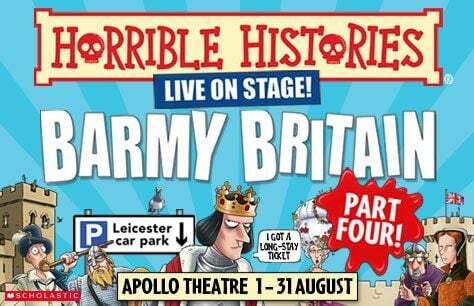 Horrible Histories is back with Barmy Britain Part Four tickets! Fear not! Barmy Britain is back in the West End and tickets for Part Four can be yours in a matter of moments. With seven fabulous years in the West End already under their belt, Horrible Histories: Barmy Britain part four returns to the Apollo Theatre after a sold out run in 2018. Barmy Britain Part Four is entertaining and enlightening, funny and informative and just a little bit gross. Year after Year West End audiences are thrilled by the Horrible Histories: Barmy Britian Part Four so it's no surprise that they'll be making their way to the stage of the Apollo just in time for summer! If you're looking for something to do with the whole family this summer, look no further. Barmy Britain is for everyone aged 5-105 (though they warn that people that are 106 might not be too keen). In the midst of the hubbub of London transport yourself back into the history of England, but don't worry, the theatre is air conditioned! Watch the ruthless Romans wreak havoc. Find out where you stand with Richard III. Mutiny against King Henry VII. See Mary Tudor go toe-to-toe with Mary Queen of Scots.Will Queen Elizabeth I survive her terrible teeth? Would you find yourself at the end of a noose, accused of witchcraft by King James I? Take a look into the world of Samuel Pepys and help Georgian detectives hunt for the headless man. Learn about the dirty work of the night soil men and learn how to make it to the end of the first ever train ride. Any don't worry, just because it's called part four doesn't mean you'll be adrift if you didn't catch the first 3 instalments! Barmy Britain tickets are the perfect cure to the summer time sadness. Round up your friends, your family, your friend's family and book tickets to Horrible Histories: Barmy Britain Part Four.